A panic attack – also called an anxiety attack – is a short period of intense anxiety or fear that can last from just a few minutes to half an hour. Panic attacks are very common in Australia where over a third of all people will experience at least one in their lifetime. 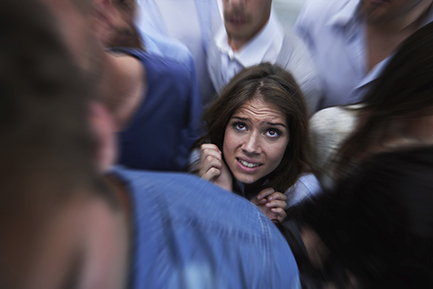 A panic attack is caused when the ‘flight-or-fight’ response is activated inappropriately. Often, no immediate danger is present. The brain floods with chemicals, including adrenaline, which trigger physical symptoms. Panic attacks may occur frequently and sometimes occur for no apparent reason. It may take several hours to recover from a panic attack emotionally as well as physically. Often a person suffering from panic attacks will change their behaviour to avoid the risk of experiencing an attack. Avoidance behaviour can begin to control a person’s life and be distressing and disabling to the sufferer. Untreated, panic attacks may occur more frequently and increase in duration. If you are experiencing panic attacks, it is important to seek treatment. A range of options can help including medical (drug) and psychological treatments including cognitive behavioural therapy, stress management, relaxation and mindfulness techniques. A psychologist can help you learn to manage your panic attacks today. Panic attacks are scary; some people may feel as though they are having a heart attack or dying. Talking to a psychologist will help you obtain the skills to prevent this feeling from happening to you again in the future. We have 3 clinics across Melbourne with supportive psychologists ready to help. Our client Connect Team will match you up with a suitable Psychologist based on your needs. Call today (03) 9809 1000.